A wildfire is any unplanned and uncontrolled vegetation fire which may require suppression. Most wildfires in the UK are started by humans, and occur on moorlands, heaths, grassland, woodland and agricultural land. We can help to prevent damaging fires by managing people (ignition sources) and vegetation (fuel). Not all fire is damaging – controlled fire is a traditional management tool in fire-tolerant ecosystems. Zero tolerance to all fire can create larger fires. Fire ecology recognises the complex interactions between fire, ecosystems and people. Wildfire was included for the first time in the National Risk Register of Civil Emergencies 2013 (section 2.3, p8). It is identified as a key risk in Defra’s (2012) UK Climate Change Risk Assessment (CCRA). The likelihood of wildfires occurring may increase between 10% and 50% by the 2080s with projected warmer, drier spring and summer conditions. Wildfire is cross-sector risk; CCRA identifies it as a major risk for biodiversity (BD 12) (Brown et al., 2012), but it is also cited in the forestry (Moffat et al., 2012), transport and water sector reports. More frequent severe vegetation fires would lead to significant loss of biodiversity and ecosystem services such as carbon storage for ecosystems like peatland and heathland, which are particularly sensitive to fire. Over 118,000 ‘grassland’ fires were recorded by Fire and Rescue Services in Great Britain in the financial years 2010/11 and 2011/12. They are strongly weather-related so are challenging to plan for; on average there were 374 a day in the dry April of 2011 compared to 30 a day in January 2012. [Fire Statistics Great Britain, 2011-12]. Response costs alone are estimated at £55 million a year, and up to £1 million for a big moorland fire. Wildfire Management – What weather and climate information do stakeholders need? 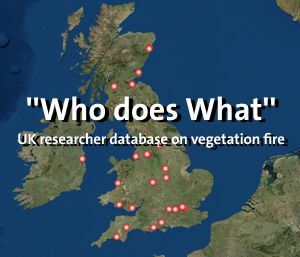 What can the UK learn from New Zealand wildfire risk management systems? Content copyright: Knowledge for Wildfire ©2012.